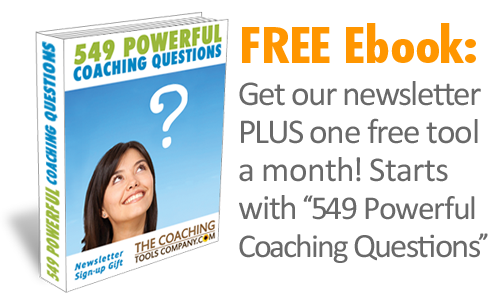 Inspirational free coaching questions for your clients, coaching sessions, social media & more! Most of our coaching tools are step by step exercises that allow (you or) your clients to reflect on, work through, learn about themselves and often to identify actions for specific issues or goals. On this page you will find Free Coaching Questions to help you get inspired and create powerful 'Aha' moments with your clients! 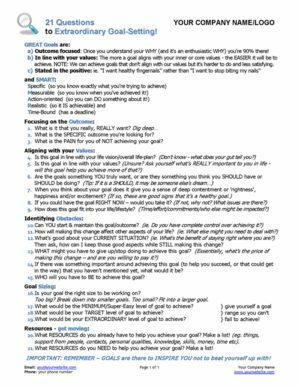 Two (2) straightforward lists of helpful coaching questions for setting goals and getting unstuck. You can use these with your clients or give them to your clients as a handout. A Wrap-Up Session Coaching Questions Tool. 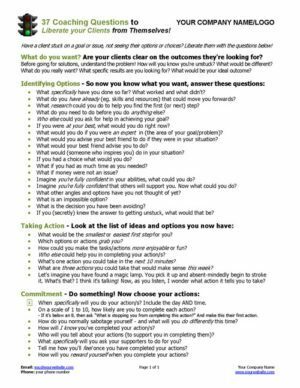 You or your client can complete this form before, during or even after your last coaching session! 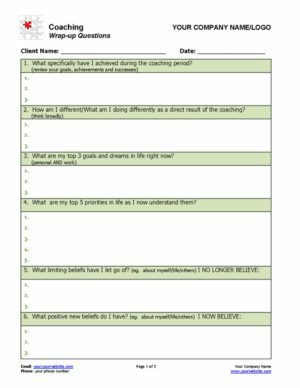 These Free Coaching Questions are intended to help and give you a boost in your coaching practice. 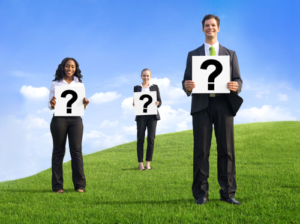 Each coaching question list was created by a professional life coach. We know how much time it takes to set-up and run a coaching business, and how hard it can be when you're first getting started. And we love great coaching questions - we believe they are one of the most important tools in a coach's toolbox! The Coaching Question Lists and Wrap-up Session Questions Form have been created in Microsoft Word which allows you to customise the wording, add your own coaching questions as well as add your branding and contact information. This means these free coaching questions can also be a marketing aid and given out to clients or workshop attendees - making sure that people both remember you AND know how to contact you! 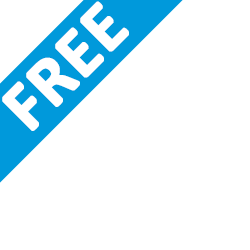 Finally, our Free Coaching Questions have the same professional look and feel as our paid coaching tools - and the same licensing terms also apply. We really hope you like these free coaching questions and find them helpful. If you ever have any suggestions or ideas we would love to hear from you.